Believers Bookshelf - What Should I Wear? 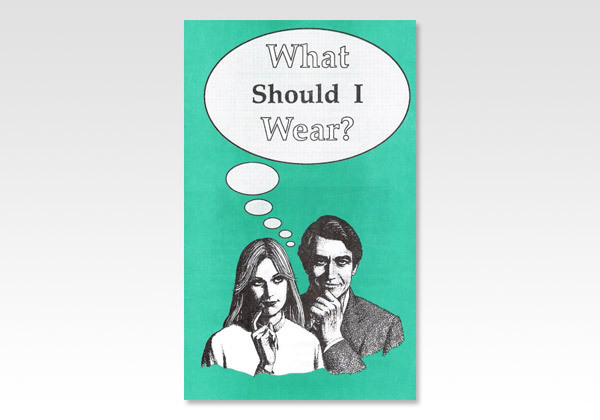 This question has been around as long as there has been variety in clothing. In today's society it can present quite a dilemma for men as well as women. However, the Bible gives definite guidelines for the appearance of the Christian before God, other believers, and the world. What is the main purpose of clothing, and why was it instituted by God? Before Adam and Eve sinned they were naked before God and before each other. When they sinned they immediately lost their innocence. First they covered themselves with fig leaves and then they hid from God (Gen. 3:7-8), all because they were ashamed. God, in his mercy, provided them with animal skins (Gen. 3:21). The curse of sin was already realized in the death of these animals sacrificed to cover the nakedness of sinful man.